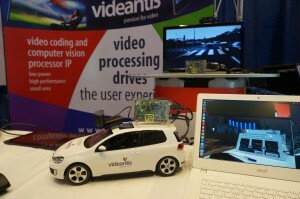 videantis GmbH, headquartered in Hannover, Germany, is a one-stop deep learning, computer vision and video coding IP and solution provider delivering solutions for many markets, including mobile, consumer, self-driving cars and automotive ADAS. Based on a unified processor platform approach that is licensed to chip manufacturers, videantis provides tailored solutions to meet the specific needs of their customers. With core competencies of deep video application expert know-how and strong SoC design and system architecture expertise, videantis passionately serves a worldwide customer basis with a diverse range of target applications, such as advanced driver assistance systems, mobile phones, gesture interfacing, computational photography, in-car infotainment, and over-the-top TV. videantis has been recognized with the Red Herring Award and three Deloitte Technology Fast 50 Awards for being recognized as one of the 50 fastest growing technology companies in Germany. The videantis team offers an open-minded environment for individuals who are determined to look beyond today’s challenges to come up with solutions for tomorrow. Our team comprises experts in their respective field who strive for superior overall solutions, always considering the broader picture. We especially seek self-driven individuals with a desire to deliver high-quality results. A competitive compensation package rewarding special qualifications and superior achievements is part of this philosophy. We encourage anyone that is interested in joining videantis to send us their resume and cover letter. We strive to hire the very best in our industry, not the ones that best match our open job descriptions. Please contact us if you’re interested in joining our company.